22 At that saying his countenance fell, and he went away sorrowful; for he had great possessions. 29 Jesus said, “Truly, I say to you, there is no one who has left house or brothers or sisters or mother or father or children or lands, for my sake and for the gospel, 30 who will not receive a hundredfold now in this time, houses and brothers and sisters and mothers and children and lands, with persecutions, and in the age to come eternal life. This section of Mark’s Gospel follows on Mk. 10: 13–16 which dealt with entrance into the kingdom of God. The three qualities required are: (i) acknowledge one’s absolute powerlessness to achieve anything by oneself, like children; (ii) absolute dependence on God who alone can give entry; (iii) acknowledge that entrance is a gift of God. This passage may be divided into three parts: (i) challenge to and response of a rich man; (ii) riches and entrance into the kingdom of God; (iii) renunciation and reward. Jesus associates these with the idea of discipleship. “And as he was setting out on his journey” — Mark keeps the theme of a journey to Jerusalem and crucifixion before his readers’ eyes (Mk. 8: 27; 9: 2, 9, 14, 30, 33; 10: 1). Jesus’ life was associated with his journey to suffering and death. So those who “follow him” must travel the same road. There have been three previous calls to follow Jesus — Mk. 1: 16 and 19; 2: 13–14. In each of these Jesus was in movement before extending the invitation to “follow me”. In verse 21 Jesus will invite the rich man to “follow” him. “a man ran up and knelt before him” — This was a sign of respect. “and asked him, “Good Teacher, what must I do to inherit eternal life?” — The man was sincere in seeking the way to eternal life and he acknowledged that Jesus could direct him because Jesus was obviously a good person. 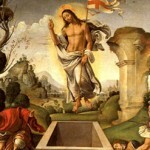 The man was of the opinion that he could attain eternal life by certain works that he would perform (“what must I do”). Jesus had just taught that eternal life is a gift bestowed by God. “And Jesus said to him, ‘Why do you call me good? No one is good but God alone’” — The man saw Jesus as “good” because he had attained excellence as a Teacher and as a healer. Jesus directs the man to understand goodness. He has called Jesus “good” but he did not understand the full meaning of his words. Jesus is “good” precisely because of his relationship with God. “You know the commandments: ‘Do not kill, Do not commit adultery, Do not steal, Do not bear false witness, Do not defraud, Honour your father and mother.’” — The man wanted to know what he “must do” to inherit eternal life. Jesus tells him to obey the commandments as that is God’s will, the sign of the covenant expressed to Moses. God’s will is that people respect and reverence their neighbour. The six commandments listed are from the second part of the Ten Commandments which deal with one’s relationship with other people. He was a rich man (v. 22). This may explain “do not steal”, “do not bear false witness” and “do not defraud” which could be associated with successful but unjust business enterprises. “And he said to him, ‘Teacher, all these I have observed from my youth’” — The man is sincere in striving for eternal life. He states that he has observed the commandments “from his youth”, which would be from his twelfth birthday when he would have assumed responsibility for his actions (bar–mitzvah). There is an indication that he is now no longer young. “And Jesus looking upon him loved him” — Jesus “looking” at someone occurs three times in this passage (Mk. 10: 21, 23, 27). What follows these words is always important. Jesus loves him because of his sincerity and integrity. By observing the commandments he has given up much pleasure that could have come his way rather than offend God. Jesus now challenges him to become a follower of his and live Jesus’ life of total dependence on God. “‘You lack one thing; go, sell what you have, and give to the poor, and you will have treasure in heaven’” — Jesus gives him an absolute command, not a counsel: “go”, “sell” everything and “give to the poor” so that you may not claim it back. The treasure where his heart will be will not be earthly but in heaven. “‘and come, follow me’” — The man was good. Jesus challenged him to be better — to give up everything so that he could give himself completely to God by following Jesus with a spirit of poverty, of absolute dependence of God. If he did give up everything he would have been like Jesus who “emptied himself” of his divinity and became man that people like this ‘rich’ man might become really rich in sharing his divinity. “At that saying his countenance fell, and he went away sorrowful; for he had great possessions” — This is the only story in the Gospels where a person does not accept Jesus’ invitation to “follow” him. What the “poor” man lacked is what he possessed! As Fr. Wilfrid Harrington has written, this is the saddest story in the Gospels. This man is never mentioned again in the Gospels, even though this story is recorded by the other two Synoptic writers. This does not mean that the encounter with Jesus did not bear fruit for him. The Gospels never tell of anyone not entering the kingdom of heaven. “And Jesus looked around and said to his disciples” — This is another case where Jesus gave a special and private instruction to his disciples (Mk. 4: 10–12; 7: 17–23; 10: 10–12). By “looking around” Jesus indicates that he has something important to say. What he will say is addressed to “his disciples” on behalf of the Church. “How hard it will be for those who have riches to enter the kingdom of God!” — The Jewish people thought that wealth was a sign of God’s approval of their way of life. That made it particularly difficult for them to give up wealth. “And the disciples were amazed at his words” — It was a completely new outlook on riches for them. But Jesus said to them again, “Children, how hard it is to enter the kingdom of God!” — Jesus stresses how difficult it is for anyone to enter the kingdom of God. He does not refer to riches in this verse. Riches are not the only thing that makes attaining eternal life difficult. “It is easier for a camel to go through the eye of a needle than for a rich man to enter the kingdom of God” — Two explanations are offered to elucidate these words. Both are not supported elsewhere. The first exchanges the word “cable” or “rope” [in Greek: camilos] for “camel” [Greek: camēlos]. The second says that there was a very narrow gate in Jerusalem called “The Needle’s Eye”. There is no evidence of such a gate. The saying should be accepted as hyperbole. The camel was the largest animal in the Holy Land; the eye of a needle was the smallest hole known to everyone. The example described the impossible. “And they were exceedingly astonished” — Their attitude was that if the rich could have such problems, then what about other people? “and said to him, “Then who can be saved?” — The disciples saw this teaching as an indication that few would be saved. Jesus softens his teaching in the following words. “Jesus looked at them and said” — The expression “Jesus looked at them” is frequent in Mark’s Gospel (Mk. 3: 34; 5: 32; 9: 8; 10: 21, 23, 27; 11: 11). It implies a searching concentration. What follows is always particularly important. “‘With men it is impossible’” — Human beings cannot enter into eternal life by their own powers or work; they cannot save themselves. “‘but not with God; for all things are possible with God.’” — When God promised that Sarah would conceive by Abraham she laughed because of their age. God said “Is anything too hard for the Lord?” (Gn. 18: 14; Job10: 13; 42: 2; Zech. 8: 6). Abraham would be the father of an innumerable nation. Jesus repeats this idea — because it is God’s work, numerous people will be saved. Salvation is a gift from God for those who depend on him. 28 Peter began to say to him, “Lo, we have left everything and followed you.” 29 Jesus said, “Truly, I say to you, there is no one who has left house or brothers or sisters or mother or father or children or lands, for my sake and for the gospel, 30 who will not receive a hundredfold now in this time, houses and brothers and sisters and mothers and children and lands, with persecutions, and in the age to come eternal life. “Peter began to say to him” — Peter is spokesman for the other disciples. (Mk. 8: 29, 32; 9:5; 11: 21). 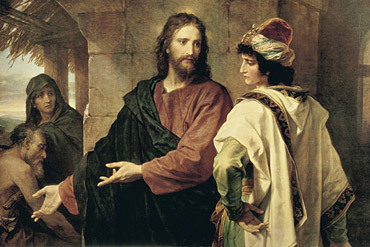 “Lo, we have left everything and followed you.” — Peter is really asking a question: ‘what is in store by way of reward for all who make sacrifices to enter the kingdom of God and become disciples by following Jesus?’ Peter is contrasting himself and the others with the rich man who was offered but refused to follow Jesus because of what he would have to sacrifice (Mk. 10: 17–22). Peter and the others were offered and accepted. “Jesus said, “Truly, I say to you” — A phrase that indicates that Jesus is about to make a most solemn statement. “who will not receive a hundredfold now in this time” — It would be clearer and more accurate to translate “but who will receive”. Jesus does not promise reward only in the next life; there will be reward in this present life also. This is the word of God. “houses and brothers and sisters and mothers and children and lands” — The kingdom of God is not a future event; it is among us. Therefore those who enter the kingdom after great sacrifices will be rewarded now as well as completely and perfectly in the future. The word “wife” does no occur in either verse, for obvious reasons! The list in verse 30 repeats the list in verse 29 with the exception of the word “father” which is omitted in verse 30. In Mk. 3: 32–35 Jesus was told, “Your mother and your brethren are outside, asking for you”. He replied “Whoever does the will of God is my brother, and sister, and mother” The word ‘father’ is omitted there also. God is our Father and so cannot be multiplied. Those who are his family do his will. One of the great insights of the Second Vatican Council is that the Church is a community, that all members form one family. All members are “brothers and sisters”. All should have the same purpose before them: to worship God and save the world, the reason for God’s Son becoming incarnate. “with persecutions” — The Christian life is the life of one who follows Christ (v. 21). The life of Christ means a life leading to suffering and death as a sign of total love for God and human beings. The list of the rewards for those who follow Christ is positive. “With persecutions” should not be seen as a negative attribute but a positive reward, sharing Jesus’ life. “and in the age to come eternal life” — The greatest reward will be “eternal life”, the kingdom of God, often referred to as a place or “mansion” in heaven. This verse is not part of the Sunday Reading. “But many that are first will be last, and the last first.” — These words confirm the promise in verse 29: the disciples are now among the least and last but in the kingdom of God they will be the first. As is our custom, we begin with asking ‘what does this passage tell us about Jesus?’ A rich man addresses him as “Good Teacher”. Jesus is centered on God and points out that only God is good. Jesus depends on him; he is his security. So if the man wishes to have eternal life he must be centered on God and do his will. He asks him to reflect on how he observes God’s will in the commandments that refer to his neighbour. There was no need to ask him about the first three commandments that speak of loving God. Obviously he loves God and wishes to share eternal life with him. The man declares that he has been faithful in the commandments that refer to his neighbour. Jesus is drawn to him in a special way for his fidelity. He challenges him and says that what he now needs to do is follow Jesus who is on his journey to crucifixion. Jesus depends on God for everything. Like Jesus, the rich man must depend totally on God for everything. God must become his only security. This upsets the rich man. He is accustomed to placing all his security, social status, personal power and comfort in his wealth and possessions. How unlike Jesus who places everything in the hands of his Father. The rich man cannot give up his security, status and happiness even for God. The man left Jesus and we never hear of him again. He loved God dearly, he thought, but what he had inherited or earned was too precious to him to give up for any reason, even eternal life with God. In other words, he loved something more than he loved God. In the encounter with Jesus wealth was more precious to him than following Jesus and his way. The rich man’s mistake was in thinking that he could ‘buy’ or earn his way into heaven. His question was “what must I do?” That was why he observed the commandments. It is true that observing the commandments is essential. However, more is required. God sent his Son into the world to teach us how to really love. We must love not commandments only but a person, Jesus who is God in the flesh. He looked on the rich man with love, as he does with us. He challenged him with the personal invitation to follow him, no matter what the cost. He singled out where the rich man was weakest. That is what he does with us. Our first love may not be wealth. But it could be something else that we place before God — power, relationships, comfort, addictions, pride, etc. What is it that we have to sacrifice to show how we really love God and our neighbour? What is our greatest weakness? Life with God in eternity could depend on our answer and how we deal with it. A Craft Group meets in the Priory on 2nd and 4th Tuesday of the month commencing on Tuesday, 9th Oct 2018, 2.00-4.00pm. Bring along your own crafts and enjoy the ‚chit chat‘ with the Group. Donation €2.00.